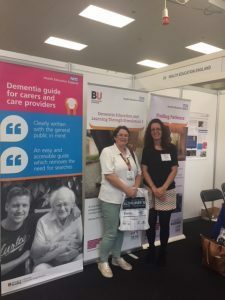 Prof Jane Murphy and Dr Michelle Heward from the Ageing and Dementia Research Centre (ADRC) were invited to join Health Education England (HEE) to showcase the Dementia Education and Learning Through Simulation 2 (DEALTS 2) programme at the Alzheimer’s Society Show in London. The ADRC have been commissioned by HEE to develop and evaluate the DEALT2 programme across England. The DEALTS 2 programme was showcased by Jan Zietara, Head of Programme Delivery for HEE, in her presentation on Saturday 9th June as well as on the HEE event exhibition stand. This provided a fantastic opportunity to disseminate the recently launched programme resources, which are now freely available to download on the HEE website. 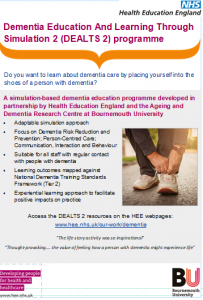 DEALTS 2 is a simulation-based dementia education programme for staff in acute hospitals across England. It is based on an experiential learning approach, placing hospital staff into the shoes of a person with dementia, to facilitate a positive impact on practice. or new audiences – watch this space! 5th June 2018 Game On! : Promoting inclusive gaming for people with dementia.